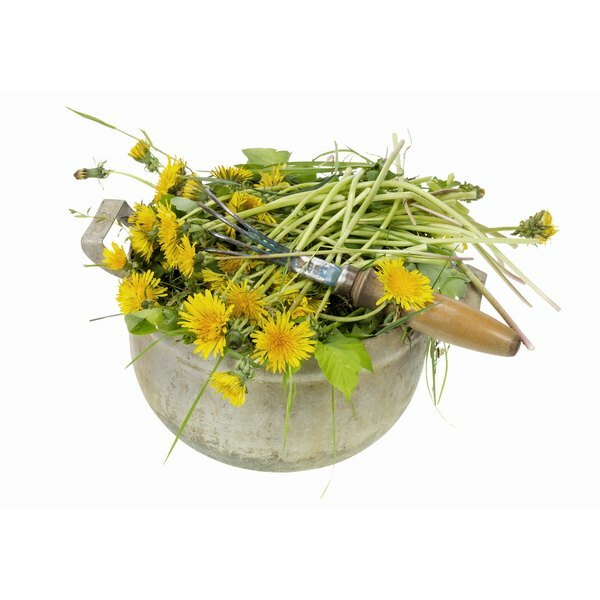 The common dandelion, a yellow flowering weed that's the nemesis of gardeners and lawn care afficionados, has been traditionally used as a natural diuretic, among other suggested purposes. In Europe, dandelion root and leaves are used for many medical conditions and is approved by the German Commission E to reduce edema, according to the Natural Standard website. However, there's little scientific evidence to suggest that it's of any benefit. Edema, also known as fluid retention, can cause puffy feet, legs, fingers and arms. Edema is a symptom that's sometimes related to a certain disease or disorder, says the University of Maryland Medical Center (UMMC). Most often, edema isn't serious, says the Mayo Clinic. Ordinary causes of edema may include staying on your feet for a long time, hot weather, eating too much salt or hormonal fluctuations associated with premenstrual syndrome. If edema goes away within a day and you don't notice other signs or symptoms, you probably don't need to see a doctor, says the Mayo Clinic. Dandelion has been used in Native American and Arabic medical systems, says the National Center for Complementary and Alternative Medicine. Historically, it's been used for liver and kidney disease and problems associated with the spleen. Modern-day uses of dandelion focus on fluid retention. It also continues to be used as a liver and kidney tonic, as well as for digestion. The dried root and other parts of the plant are used in dietary supplements, such as capsules and extracts. The entire plant may be used fresh or dried to make tea. Historically, the leaves, not the root, were used to treat edema, points out the University of Michigan Health System. There's no compelling scientific evidence that dandelion root can reduce edema or address any other medical condition. Theoretically, dandelion's high potassium content may give this herb diuretic properties, meaning that it purportedly increases urination, states the Memorial Sloan-Kettering Cancer Center. Few clinical trials–studies using human participants–have been conducted on the effects of dandelion. The UMMC indicates that dandelion tea may have some effect on fluid retention. Simply take between 4 and 10 grams of the dried dandelion and steep it in a cup of hot water. Strain, cool and consume. Due to dandelion's purported diuretic properties, this herb should not be taken if you're already taking prescription diuretic medications, says the UMMC. Avoid dandelion if you have gall bladder problems, take anticoagulant medications or have known allergies to numerous plants. Edema can be a sign of something far more serious, such as heart failure, kidney disease and liver damage, cautions the Mayo Clinic. Edema may also be associated with a medication that you're taking. If fluid retention persists, even if symptoms are barely noticeable, please see your doctor to rule out an underlying medical condition. Does Salt Make You Retain Water?